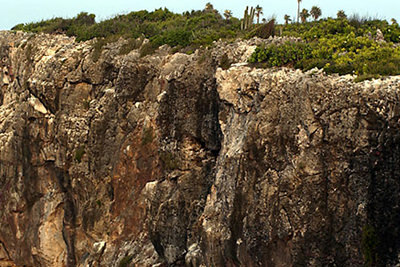 The most interesting - and prominent - topographical feature in the Cayman Islands is the "Bluff," a steep cliff located on the sister island of Cayman Brac. In fact, the word "Brac" means "bluff," and describes this geological wonder that traverses the island, rising in places to 140 feet in height and offering spectacular views of the sea. In early spring, the foliage atop the Bluff is breathtaking. In recent years, the Bluff has become a popular site for rock climbing and, in fact, as many as seven locations on the east end of the Bluff have been ascended. Climbers then rappel down the side of the Bluff to just above the turquoise reefs below. Some special techniques and skills are required, but local guides can prepare you for these terrific climbs. 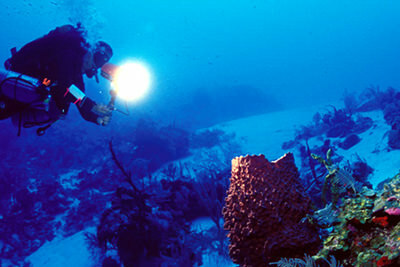 The famous "Bluff" of Cayman Brac is riddled with caves, some large, some small, and some spectacular. In days gone by, "Brackers" would seek shelter in these caves from hurricanes, and many perished in them during the horrible hurricane of 1932. 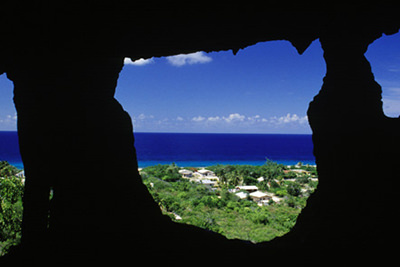 Today, these caves are accessible to tourists and among the more noteworthy are "Peter's Cave," facing the North Side toward the sea, the "Bat's Cave," which not surprisingly is home to many small bats which depart on nocturnal feeding forays, and the "Great Cave," located near the end of the South Side.